This thread is meant to be a discussion forum for APK's announcement on August, 27 of entering a partnership with FremantleMedia Enterprises and Motion Inc. Please read the announcement and press release before posting on this thread. I'll be posting more later but for now I gotta go run a practice. Please keep the discussion civil and respectful. "The primary objective of the deal is to grow the sport into a global entertainment franchise and league competition..."
Parkour doesn't need to be turned into a sport to have widespread appeal, and that's what they keep trying to do. They need to realise PK as is 'good enough' to encourage tens of thousands of people to train easily and even without a competition aspect there would be a major influx of new practitioners. Of course I hope it doesn't mean exactly what it says and that I just rambled on for no reason. I really honestly do. What you have to keep in mind, especially with this line, is that this press release is not meant for the general public, or the parkour community. It is meant for those within the entertainment industry to officially announce the partnership and the intention. That's true, but they should be giving the same story to everyone. They can't say that in the press release to begin with, and then claim it's false when formatted into a parkour community release. I know they haven't, but your argument is moot unless they want to send mixed messages. I'm all about Parkour spreading. I would say there's room for competition too, even if I don't support it myself (because I fully understand some do, and that's how they push themselves to be better). The words "global entertainment franchise," however, seem the complete antithesis of PK. the media cant possibly portray parkour in the light it is meant to be seen. i mean, we the community had so many issues with parkour and free running. if we had such a problem, just putting the right meaning to words, then the media couldn't possibly do any better. i dont want parkour to be shown this way but, i havn't seen it so i cant really talk. i just dont feel that showing it to masses of people is the right way to go, its supposed to be a small personal thing, not something for entertainment. Sorry but.. this just sounds ridiculously stupid. To me, this feels like a big stab in the back from APK. I don't see how they could have thought this as a good idea. What I don't like is: "producers of the Emmy-nominated musical/reality phenomenon â€œAmerican Idol" (FOX), â€œAmericaâ€™s Got Talentâ€� (NBC), and the longest-running game show in television history, â€œThe Price Is Rightâ€� (CBS), among many others." That means it's in the hands of game-show producers. HUGE game-shows. That contract better be written so they can't ditch APK and continue towards their own goals, which I don't doubt that's what they want. What are their goals? Look at their history, it's not hard to guess. Again. Parkour and Freerunning are the same thing. Repeat that as many times as needed to get that into permanent memory. The upside is that Parkour//Freerunning would be introduced to schools! YAY! ...then the upside might just overway the down side. very well see a mass number of injuries spread due to people just wanting to look cool on T.V. and not taking the proper amount of time to train. Parkour and Freerunning are the the same thing like Longboarding and Vert are the same thing. Seriously. Thats all you need to do. Unfortunetly I have no idea what Vert is, or longboarding either. parkour, or l'art du deplacement are different, then they are the same. Pretty simple really, no one ever did. Different words, same def. Watch this, it will actually help clear things up. Chau explains right in the beginning. What I'm particularly worried about is what kind of people these shows will attract. The way it is now, people find it through the internet and videos, so we have a very diverse community with people of all ages and social groups. Despite the fact this is a very athletic activity, there's a huge amount of "nerds" or "geeks" doing it. I feel like that community will start fading away once parkour goes commercial. Once it goes on TV, there's a certain stigma that it gains, which may make it too "edgy" for some of the more diverse people who would otherwise be interested in it. By now there's really no questioning that competition or commercialization will happen; I just hope APK does it right and doesn't try to make it seem like a grungy street sport. There needs to be people that are relatable to all social groups, otherwise I fear for the parkour community's diversity. Another thing that worries me is that schools, parks, and other places will see these shows and see them as too dangerous or leading to possible criminal action and putting up "No parkour" signs up. Again, this is mainly worrying about how "cool" they'll try to portray it. Emphasis should be put on where to practice, respect of one's environment, etc. From here our image is not up to the individual practitioners, but up to companies like APK and the WFPF. The new influx of traceurs and freerunners and how they act will be something that will affect the rest of us. Please try to tone down the large moves and acting cool and focus on the beauty and philosophy of our practice; it won't get you as many new practitioners, but there's a better chance for us to keep a better image. It's really on your guy's shoulders now, don't let us down. If apk starts doing competitions I'm boycotting them. PKFR International is better anyway, they just don't have an active forum. I just simply don't want to see the values and disciplines of parkour to be thrown out the window once it is commercialized. Things like respect for your environment, and others can easily be replaced with competition, and a "rebellious" attitude where you just go and do whatever you'd like, because you're a traceur. Especially with kids, as they take anything they see on tv and try to emulate it. That's my only real worry. I kinda loved having parkour as that "secret" sport/discipline that i could get away from everything with. People wouldn't question what i was doing, or challenge me, or anything, it was just me and the obstacles in front of me. I don't want it to become something where its all competition and not having fun. It's what happened to skateboarding. Longboarding and vert are types of skateboarding. Yeah, they're both skateboarding, but itd be silly to deny the extreme difference in style, philosophy, and purpose between them. Also watch redbelt. seriously. Fyrel: Thanks for your post. I feel that you've presented points in a way that is ACTIONABLE and helpful. I'll say this now, and I'm sure I'll say it 1,000 MORE times although I wish this once could be it. We don't want to change Parkour (although parkour is constantly changing) we want more people to be involved. 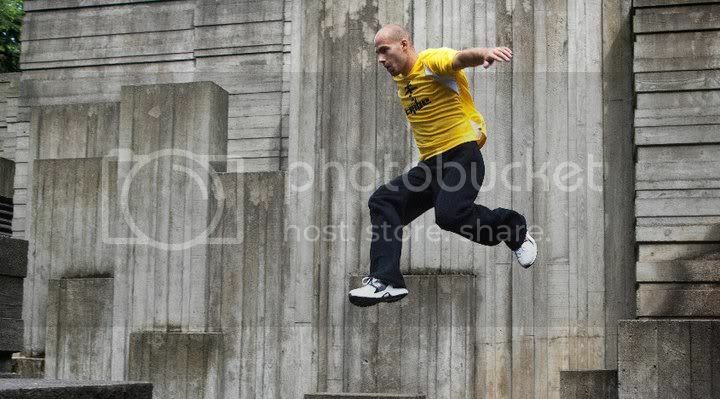 We do not want to change the way parkour is portrayed, we want it to be acceptable to the public. We don't want to get a reputation like skating has, we never did. This venture doesn't change our values, it gives them a much larger audience. As for the comment about Fremantle's goals, does "The Price is Right" or American Idol" somehow hurt somebody or something? Is singing now bad because it's on TV? no, there will not be bar fights, again, look at the Tribe as being the athletes - do you trust them and their reasons for training? I do. Each part of this plays a role in how parkour is spread, how it is percieved, and who gets to hear about it and therefore "make the leap" to practice. My commitment to the community is that #'s 1-4 above will change as little as possible (to say "they won't change" is irresposnible and unrealistic) - I can say that their missions won't change - Make Parkour and Freerunning accessible so that anyone who wants to practice can find good information on how to train safely and how to progress. I know and understand many of the arguments against competition, what I suggest is that if you'd like to be helpful, you stay as active as possible, train as hard as you can, help as many people around you as possible, write articles, if you're qualified, teach people formally, if not, help those you can help. Give us SUGGESTIONS on how to do it RIGHT, not just what you're afraid we'll do wrong. A 3 year old child can flip a light switch and tell you it is broken. It may take a nuclear physicist at the other end to fix the problem and get power restored. Don't point out problems, become part of the solution. The difference with singing is it has nowhere near the wow-factor with the general public that PK/FR has. I still want you do do this, but please just watch them closely. And guys, don't assume anything with this. As Travis said, this is just a standard press release. I'm excited to see what happens. Here's my two cents for those of you that care. PKFR International and the APK Alliance. Most of you know that PKFR International is anti-competition. PKFR International directors Dylan Baker, James Phillips, and myself have been working hard to prevent competition since the beginning and will continue to strive to keep parkour a non-competitive discipline rather than a competitive sport. There is "good competition" in parkour but it's competition within yourself to better yourself. The point is that since I have been working with APK, my views and principles about competition have NOT changed. But, what has changed is my faith in Mark and my fellow APK team mates. Their dedication to movement, their goals and principles, and experience help assure me that things will be alright in the long run and even if competition occurs, I think it will be done more responsibly, more respectfully, and less competitively than the Barclaycard World Championships and Redbull Art of Motion. I'm not going to sit here and say everything will be 100% perfect and that there won't be any loss or change but I'd rather have people I trust do something I'm against than have people I don't trust make things even worse! As Will James would say, "PKFR OUT!"